When protecting your business, for years owners have had to plan out security camera systems using high numbers of cameras if they wanted to actually be able to get the clarity they desired to distinguish people or vehicles. This is because traditional CCTV technology employed analog image sensors that were tied to the accepted standard for video resolution - yes the same resolution as old, non HD TV. 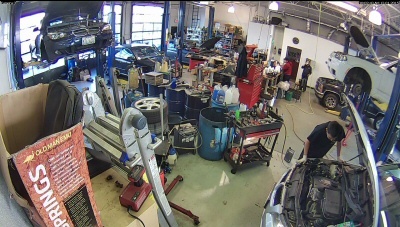 This meant that each camera could record around a maximum resolution of 720x480, therefore in order to get quality on people or vehicles, the camera would have to be mounted with a zoom lens, to bring the camera closer to a pinch point where a vehicle would drive in or a person would enter the facility. While this could be effective, a large number of cameras would be required to provide the necessary coverage. However, today the technology exists that permits coverage of wider areas with a single camera, while still delivering extremely high quality footage that will still allow you to capture distinguishing characteristics on people and cars. 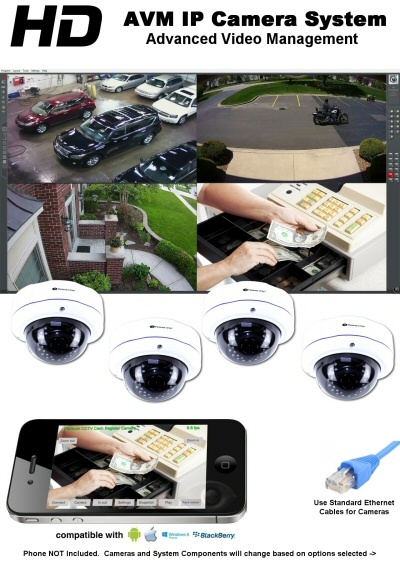 Leading the charge of new technology, are affordable HD IP cameras. These new cameras incorporate high definition image sensors, together with video compression processors that allow the cameras to send HD quality video over a standard CAT-5 ethernet cable back to an NVR server (Network Video Recorder). With these high def video streams, it is now safe to use wider angle lenses to cover more of your business with a single camera. Now in areas that used to require 5-10 cameras, 1 or 2 cameras can be used with the same level or higher of image clarity. High Definition IP cameras are now available from many different manufacturers, with even cheap knock-offs making their way onto the internet. It is very important to understand the technology, so that you can make an informed decision prior to making a purchase. If you watch any major news outlet, you have probably seen at least a few special bulletins about hackers cracking into video streams, or worse even using internet facing IP cameras to reprogram and use as a gateway to perform even more dastardly deeds. In today's world, this is a real concern. When protecting your business from the immediate physical threats, you could expose yourself to much more damaging outcomes like: Camera that was hacked and now helps hackers collect credit card info from your network, IP camera hacked to provide a gateway to get into your computers on the network so business secrets, account number or more can be stolen. The possibilities are endless when poor technology is employed in careless ways. Big Box stores flood the market with these poor solutions, and the majority of them are vulnerable, because they try to make the product as easy as possible for a novice to install and connect remotely to see the camera. These cameras have built-in processors and network cards, and with most of these solutions, the cameras are always in direct contact with an outside server on the internet. While that may seem appealing, this makes the camera very easy to access, but the access is being performed via a 3rd party server on the internet. This is like leaving a key for your business on the front mat. There is a much better answer: Employ Enterprise Grade and Secure equipment from a company that can configure it for you for better security. Enterprise-grade video security systems, like our AVM (Advanced Video Management) systems, have been permitting remote access to your security cameras for years...but in a much safer fashion. 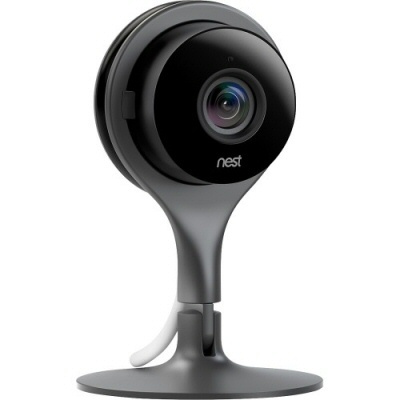 With this camera system, when you connect from your phone or your computer at home, it is establishing a direct connection to your DVR or NVR directly. It isn't passing through another server or cloud on the internet to accomplish a connection. This means that you will be able to easily access your system, but access it securely. So what is the drawback? With these types of systems, it involves a bit more configuration to set up your internet connection, forwarding ports to allow the connection directly. Most business owners don't know how to do this, which is why the industry has been pushing towards this new cloud-type technology for ease of installation. Our solution to the problem is much more comprehensive and respectable: with each of the systems we sell, we remotely help configure the internet connection for remote access to get you connected. This means it is just as easy...and in many cases more powerful. 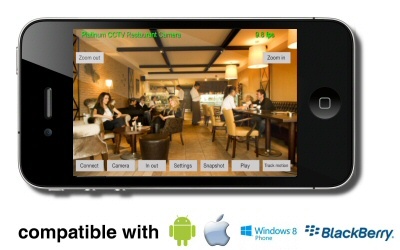 We have been helping our clients watch security cameras on their phones since the days of the flip phone, and were one of the first with iPhone access, Android access and BlackBerry access even. This means our apps are also more secure, and more feature-rich than newer cloud based platforms. With new technology, comes new challenges. This is why we go the extra mile for our clients. Wide Angle HD IP cameras on the surface may seem to be easier to place than traditional narrow lens cameras, however it can be much more challenging to determine as now one camera is performing multiple tasks simultaneously. Placement of newer HD IP cameras becomes important, in order to be able to capture a person's face when they are entering the facility, but also capture store shelves, restaurant counter, or employee work areas. This is why with each of our clients, we perform a security assessment, looking at all of the obstructions and important areas. With our clients in the Chicagoland area, we always conduct this security evaluation on-site to locate the best placement of security cameras to protect your business properly. With internet clients, we can provide the same type of assessment with a few pictures and layout of the facility. This helps to ensure that not only will you be protected, but you will be protected by quality equipment deployed with the knowledge of a security professional who has been in the business for over a decade. We do not charge extra for these steps, because it helps to ensure your satisfaction with your security.